Business Day editor Peter Bruce, in his column in Monday’s newspaper, had a remarkable go at First National Bank CEO Michael Jordaan. Jordaan had sent a note to the bank’s staff headlined “Do we really need newspapers?” in which he’d questioned the need for the company to continue spending good money on newspaper subscriptions. “We think we should simply stop subscribing to newspapers,” Jordaan wrote. Bruce fired back, accusing Jordaan of putting a knife in journalism’s back, and took particular exception to the FNB CEO’s statement that all the news is available for free online. “Of course it is, but how did it get there? I’ll tell you. It was written and edited by journalists who earn salaries working for newspapers. “You can be indifferent to the future of newspapers, but not about journalism,” he wrote. 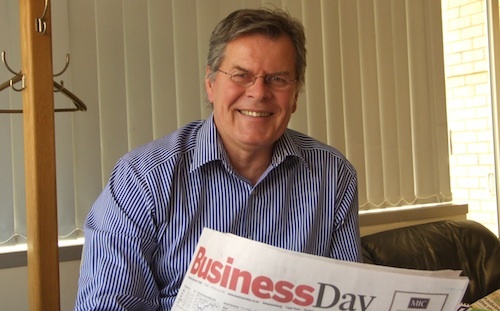 Bruce’s column came just days after I sat down with him in his Rosebank, Johannesburg office to talk about the future of the newspaper industry. There’s no doubt that Bruce is passionate to his very core about newspapers and, though concerned about the future of quality journalism, makes it clear he has no doubt that newspapers are not going anywhere. It’s not a view shared by all of his colleagues. When I suggest to Bruce that no-one under 30 will ever regularly buy a newspaper, he says I’m dead wrong. “Young people always say they’ll never read a newspaper, until they start,” he says. Bruce says that what concerns him much more than the Internet — at least for the time being — is the worldwide economic crisis and what it’s doing to advertising revenues. At Business Day, Bruce says he feels the financial crisis “far more acutely than the Internet”. Business Day has retrenched staff in recent months and cut costs to the bone — and other newspapers are doing the same. “It may be the wrong response, I don’t know, but I feel the Internet is something I can do something about, whereas I can’t do anything about the financial crisis,” Bruce says glumly. He says newsprint has a long future ahead of it, but admits he’s “deeply concerned” about what the Internet means for the future of quality journalism. He’s worried that free online content is going to undermine quality content. Good journalism, he says, is expensive. Newspapers have been able to support these costs because advertising is expensive, he says. It’s not clear to Bruce whether online advertising models can pay for the sort of quality journalism people expect from newspapers. That probably means people are going to have to fork out more for newspapers, to pay for the journalism and to offset a decline in advertising as readers go online. It could prove to be a vicious circle. In recent years, Business Day has been pushing up its cover price, far in excess of the inflation rate. The paper costs R9,50/copy, compared to R5 for The Star, the Johannesburg daily. Going the way of the vinyl record? Ray Hartley, editor of The Times, is not nearly as bullish on the future of print as Bruce. He says newspapers will eventually go the way of vinyl. They’ll still exist, but it won’t be the main way people get their daily news content. 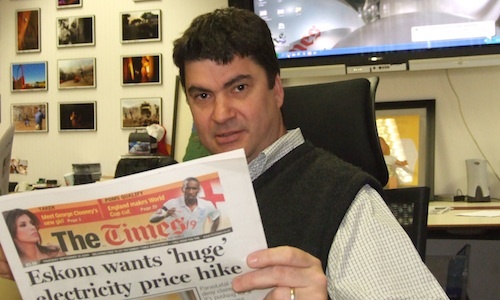 Hartley says The Times, which is the daily sister paper to the Sunday Times – both newspapers are owned by JSE-listed media group Avusa – has already stopped thinking about itself as a newspaper. Instead, it is a producer of content that is then served through a variety of channels. “The amount of time people spend reading newspapers has declined dramatically but the amount of time people spend consuming news across all platforms has expanded dramatically,” Hartley says. “The news business is booming; it’s just not booming in newspapers. 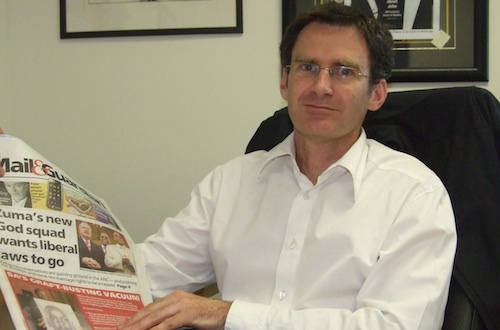 Hartley has been one of the country’s biggest proponents of technology in print media. He was the first newspaper editor in SA (that I’m aware of) to introduce a fully integrated newsroom, where journalists are expected to produce material not only for the newspaper, but also for the Web. When Avusa launched The Times in 2007, its journalists were told they were expected to write not only for the paper and the website but also to produce multimedia content, including video material and podcasts. Unlike Bruce, Hartley believes it is inevitable that people will migrate in large numbers from newsprint. It’s just a question of when. The challenge for editors, he says, is ensuring that when readers of their newspapers desert them for the Web those readers don’t go to a website operated by a competitor. Hartley says SA newspaper editors and publishers are fortunate in that they have been given a period of grace because of the country’s high telecommunications costs. They can learn from the US experience. Whether they will is another matter. A number of people have remarked to me in recent weeks that newspaper editors can be thankful for former communications minister Ivy Matsepe-Casaburri. Thanks to her blunders in telecoms policy formulation, SA is years behind in broadband penetration, they say. “We’re actually in a very fortunate position because we have seen what happens in other markets when broadband becomes ubiquitous,” says Hartley. “People became disloyal to print. Mail & Guardian editor Nic Dawes thinks that proverbial wolf is already at the door, especially at newspapers that appeal to SA’s small pool of high-income earners. Though the Mail & Guardian has demonstrated a healthy increase in its print circulation in recent years, Dawes says that without the Internet, “our growth would have been stronger still”. The Mail & Guardian was the first big newspaper in SA to launch an online edition. It pioneered the space in many respects but has fallen behind in visitor numbers in recent years. Part of the reason for this was a poorly thought-through agreement with Naspers. But that’s an entire story on its own. Dawes, who took over earlier this year as editor of the Mail & Guardian from Ferial Haffajee, who now edits City Press, has big plans for the newspaper’s website. He says the Mail & Guardian Online has given up trying to compete head-on with the likes of Media24’s News24 and the Independent Group’s Independent Online, or IOL. Both of these sites tend to use mainly Sapa, Reuters and other wire copy without adding much editorial value. Dawes says he wants to use the Web to provoke more conversations with readers. Dawes says he is under no illusion that the Internet will eventually hit the Mail & Guardian’s print circulation, but says it’s not going to happen immediately. Though the Mail & Guardian’s print circulation is still growing — it’s selling about 50 000 copies a week — it targets the high-end of the market that is most likely to switch first to the Internet for news. All three of the newspaper editors I interviewed for this article – Bruce, Hartley and Dawes – agree that mobile phones could prove to be even more disruptive to the news business than the computer-based Web. Dawes says unlimited data plans on cellphones, coupled with one particular handset — the Apple iPhone — have driven up readership for The Guardian‘s online edition in the UK. And people are reading The Guardian online at times that perhaps they didn’t before — on the Tube, or the bus. He says the same trend in mobile news consumption will eventually reach SA, but it’ll take a long time. Bandwidth prices will have to fall further, and the price of large-screen cellular handsets will have to fall dramatically. Perhaps young Daily Sun readers will be getting their daily gossip fix on their cellphones, instead of from the newspaper, in as little as five years, Dawes says. Hartley agrees that news delivered via mobile phones could eventually become big business for media companies. But he says no-one has figured out the right model yet. There’s no doubt in his mind, though, that South Africans will take to news on their mobiles like ducks to water. And therein lies the biggest debate. Who is going to pay for quality journalism? Or does the digital world simply mean that quality journalism will suffer? The debate over whether users should pay for content online has surfaced for the umpteenth time, this time around thanks to News Corp’s Rupert Murdoch, who has said he will put up pay walls on News Corp’s newspaper websites. Many of his peers have said that horse has already bolted, that people will simply find another source for the content, where they don’t have to pay. I’m inclined to agree. I’m far from convinced Murdoch will get it right, especially not with his less high-brow websites. Hartley says newspapers can only charge for content online if it is unique and has value. If the information can be found elsewhere, online newspapers that charge for content will simply lose their audiences. The Wall Street Journal arguably has that content, and, until recently, charged for some of it and was relatively successful in doing so. But how many newspapers produce content that has as much value as the Journal? I’d argue, very few. Hartley thinks newspapers may get away with charging for some content, but concedes that newspapers will still have give away their big stories to attract audiences. And newspaper groups can’t get together to agree to throw up pay walls because they’d be hauled before the competition authorities for collusion. Newspapers would be crazy to throw up pay walls around all their content, Dawes says. Their journalists would resign and start rival products online that are twice as good. One journalist who embraced the Web in its early days, Alec Hogg, believes the changes sweeping the newspaper industry are inevitable. “It’s finally online’s time,” he tells me over coffee at Melrose Arch, north of Johannesburg. If you think of a newspaper as a vehicle for attracting advertising, then yes, it is finished. Even online, newspapers can’t cut the cheese with ad sales. Subscription models won’t work. Because the lifeblood of an online news platform is linkability, and subscription builds fences around your content. Turn newspapers into movements. Become a brand that people want to own. Create merchandise. Turn journalists into rockstars. Have a strong point of view. Be the focus point of a tribe. This will create new revenue streams previously unheard of for newspapers. I hope FNB is counting the costs of all their staff saying, “Just catching up on the news, boss” as they update their facebook account! I still like the idea of taking a newspaper, sitting down and reading. I think getting your staff to do that is a great way to wind down and de-stress. But maybe FNB is just trying to save some money so that they can reduce service fees to their clients 😉 Hahahahaha…. yeah right. 4) I block all adds, so I don’t even give back to the news outlet. I was going to say I was sorry about pint 4 but then realised I’m not since I hate getting 20 adds on a page that rotate and flash at me, be gone. I turned off my add blocking for IOL to test what its like, I turned blocking right back on again as it was such a horrible experience with all those adds. At some stage it will simply be unprofitable to print as my guess is that those costs will keep going up. With devices like the Kindle and such maybe people can tie down content. Or perhaps newpapers that charge 10c for a article instead of R16 for a newspaper might find me willing to pay for locked down content simply because the price is so low. But the next generation won’t care for 10c is my guess unless you deliver on a platform where they already pay, i.e. the cellphone. Very interesting article. I don’t think people will pay for online news – publishers must find new business models. No one pays for Radio/TV news. Why should we pay for online news? By the way, why only talk to these three editors? What about the Daily Sun, Beeld or the Sowetan. These are some of the main papers around. Their decision would have a way bigger impact compared to the small M&G and Business Day. Elitist anyone? If the M&G only sells 50k copies a week, the wouldn’t ever get enough people online to pay for their product. Nice piece Duncan. I guess one extra thought now I read it, is that obviously newspapers cannot survive into infinity. The difficulty is when commentators try to predict exactly when the last newspaper drops onto the last driveway. I think Alec H is being optimistic (pessimistic perhaps) when he talks about “When the Boston Globe closes, when the LA Times goes into receivership…”. I’ll bet you both survive this financial crisis. In fact, once the recession passes, so will debates about the end of newspapers. There will be an end but let’s agree we don’t know what it looks like yet or what the cause will be. The issue to worry about is not newspapers but the quality of the content. Nobody reads junk, free or not, it just happens that the Internet news sites count a hit as a read whether or not the surfer read the article or clicked away. If Web news sites they ever start charging they will quickly be in the same position as newspapers because they churn out crap. Great piece and really nice comments. I am really enjoying your new venture Duncan. What is likely to happen is this. The “rainmaker” writers will be in great demand and a bidding war will start to attract them to new sites. Meanwhile, it will be easy to measure who is read and who is not and, therefore, who attracts the advertising. This means that individuals will have to be rewarded properly (unlike newspapers). I now write for three websites and they all pay substantially more than newspapers are prepared to pay for the same copy. One column is sponsored by Outsurance and the other two are in negotiation. If a deal is signed I will share substantially in the revenue. That makes sound busines sense to me. Last week’s column on Moneyweb got 90 comments and the top rating is over 300 comments. So the message is….buy the best writers, attract more readers and attract more advertising. Simple innit? Great piece as usual Duncan! I believe that news publishers need to distinguish between physical newspapers and journalism. I don’t see paper newspapers having much of a future although I do believe in supporting quality journalism. There is a lot of free news content online but that is frequently free to readers by virtue of an innovative revenue model. Your revenue model isn’t novel but it seems to be working at the end result is that I can access great content on your site, essentially for free. Ideally I would like to pick up my news in my feed reader via full feeds, not truncated feeds, and that may involve some sort of subscription. I am ok with that. I already pay to receive two magazines and I’d pay to receive great news content on a variety of flexible devices. RSS may be just the right tool for that. Killing the messenger, Mr Bruce? I would rather seek sincerity in news, where obviously old and archaic methods of delivering news are fast falling short of today’s emotional requirements. I don’t want to tell my friend to buy the newspaper over MSN but rather send him a link. Also daily newspapers work off sensationalism and looking at certain daily publications in South Africa whom I lost all respect for during the Mbeki-Zuma struggle should reconsider where exactly their professionalism lays. Also when online newspapers defeat ctrl-c ctrl-v and me emailing bought for content to 20 friends for free? Excellent post, and a great balanced view of the continuum of opinion online regarding the future of newspapers. From the perspectives given in this article, I would say that Ray Hartley really ‘gets it’ in a more profound way than his contemporaries interviewed in this piece, and his climbing online traffic is testament to this. I work for a Media24 company and attended a conference recently where we were addressed by the head of the World Association of Newspapers. I was shocked and appalled at the directions in which they were thinking. Ray’s thinking is way more progressive than most other news publishers.